BES leadership training is designed to equip emerging and established leaders with the skills and resources they need to deliver for their students and communities. Our programs cover nearly every aspect of running a school, from managing difficult conversations and coaching in real time to developing instructional models and supporting school operations. Behind every excellent school is an excellent leader. BES training enables leaders to inspire their teachers and improve the lives of their students — all while honing their skills and elevating their careers. At BES, we recognize that leaders need to be supported and challenged in the right way at the right time. From yearlong cohort-based trainings to short, two-day intensives to coaching tailored to specific needs, our leadership and organizational development programs do just that. Leaders for Emerging Networks of Schools, or LENS, is an intense training for individuals preparing to take on heightened leadership roles within urban schools. LENS participants study the best practices of successful charter schools from across the nation and develop their leadership voice and mindset through hands-on coaching. LENS is a valuable tool for schools looking to build their leadership bench and equip a new wave of leaders. A nomination form completed and submitted by their school leader. A completed and submitted candidate application. For more information about LENS, please contact Jill Dunchick at jdunchick@buildingexcellentschools.org. 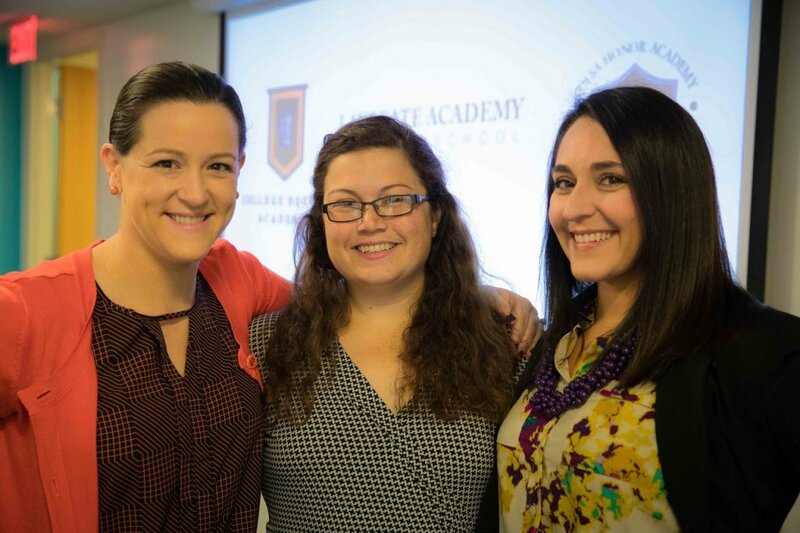 BES Weekend Warriors equips ambitious educators to improve student outcomes through study of high-achieving urban charter schools and role-specific trainings on school leadership, elementary instruction, middle school instruction, and operational systems. Each Weekend Warriors is an intensive two-day training program that begins with a visit to an exemplary BES school, where participants are exposed to the best practices in urban charter school leadership. Participants then immerse themselves in a full day of training on themes such as hiring and selection, managing and leading adults, and standards and assessments. Through analysis and role-playing, participants learn how to effectively manage their organizations so that they can concentrate on the goal at hand: delivering rigorous instruction. Whether you’re a teacher, school leader, or running the show from the operations office, Weekend Warriors has something for you. Spend two days with us, pick a track, and tackle Monday morning with sharper focus and stronger skills. Weekend Warriors kicks off with a half-day dedicated to school observation, gets down to details with thin-slicing, and is capped off with an afternoon school leadership panel for all participants. Weekend Warriors participants can expect rigorous training with BES staff and our dedicated adjunct instructors; leaders from Excel Academy, Nashville Classical, Purpose Preparatory Academy, and Vista College Preparatory. The cost for each Weekend Warriors participant is $1500. For more information about Weekend Warriors, please contact Stephanie Hellested at shellested@buildingexcellentschools.org or over the phone at 617-227-4545 x228. BES Summer Leaders are driven individuals who show talent in the classroom and aspire to become school leaders through The Fellowship. During this summer training, Summer Leaders develop their classroom and leadership skills alongside BES coaches and charter school leaders. SLI consists of an Orientation in Boston, followed by a 20-day residency at a top charter school. During Orientation, staff introduce the Summer Leaders to the work of BES and what it takes to lead a high-performing charter school. The on-site residencies provide participants with the opportunity to work on projects and learn directly from accomplished school leaders. BES may extend acceptance into The Fellowship for qualified individuals at the end of The Summer Leaders Internship. Orientation: Leading a High-Performing Charter School | May 22 – May 23, 2019 | Led by BES Director of Leadership Development, Erin Walsh-Hagan. For more information about the Summer Leaders Internship, please contact a recruiter at recruiting@buildingexcellentschools.org. Anchoring Excellence challenges and supports leaders of high-achieving schools in years three and beyond to propel student growth and achievement while sustaining organizational growth over time. Define the cycle of teacher coaching, lesson internalization, lesson execution, observation, coaching, and feedback. Detail the cycle of looking at student work, data analysis, and action planning for results. Specify the plans and processes for growing roles, and leaders within the school and larger organization. Define what it means to be a manager at the school, both for operational and instructional staff. Detail what managers do in all areas and what their specific responsibilities are. Specify the required “school way” of doing certain things and areas where a manager has more discretion and autonomy. Define repeatable and objective plans for future staffing decisions and building a talent pipeline. Detail recruitment and hiring processes to effectively distribute responsibilities across multiple roles as needed. Define approaches to catching students up and pushing them to their full academic potential. Detail what curricula are used, where there is consistency across instruction, and where there is autonomy to innovate. By analyzing their own results, leaders coach members of their team to adapt their communication to achieve better results. The cost for Anchoring Excellence is $15,000. For more information about Anchoring Excellence, please contact Luke Van de Walle at lvandewalle@buildingexcellentschools.org. BES is offering the following coaching supports for the 2019 -2020 academic year. Scroll down to learn more, and complete the form at the bottom of this page to sign up. Through Strategic Support Reviews, the BES team works with school leaders to thin-slice the organizational health of the school, identifying levers that will continue to drive the health and integrity of the organization. The SSR is an annual, daylong process during which the school leadership team is pushed to think more critically about the school to strengthen their impact and improve the quality growth of their organization. At the end of the review, the BES team will create a detailed report for the school, including an action plan intended to equip leaders to accelerate student achievement, ensure operational health, and lead the school to its next stage of success. The SSR team is typically comprised of one BES staff member and one visiting leader from a peer school who conduct the review alongside the school leader and select members from the school leadership team. Executive coaching is designed to support and challenge the most senior leaders in an organization on the skills and mindset they need to execute at the highest level. Coaches – selected based on the needs of the executive leader – provide remote coaching for one hour every other week during the academic year, tailoring their advice and approach to most effectively coach to excellence. Through these sessions, leaders are equipped with the lens, mindset, and tools required to consistently perform at the top of their game. Operations Leadership Coaching is designed to support and challenge the most senior operational leaders in an organization on the skills and mindset they need to execute at the highest level. Selected based on the needs of the operational leader, coaches provide remote support for one hour every month during the academic year, tailoring their advice and approach to most effectively coach to excellence. Operations Training and Coaching is a six-part webinar series designed to equip operations teams in schools currently in their building or growing phase with the skills and resources required to design and execute highly efficient and impactful operational practices. In addition to the webinars, teams receive six hours of virtual coaching tailored to specific challenges. Webinar series designed to train school leadership in cultural best practices – in systems, operations, spaces, rituals, and celebrations – with targeted support aimed at executing new or refining existing practices. Webinar series designed to train school leadership in instructional best practices – in systems, coaching, feedback, classroom observations, and teacher PD, with targeted support aimed at refining current systems, coaching sessions, and professional development series within their schools. To learn more or sign up, fill out the form below. For more information about Coaching Supports, please contact Stephanie Hellested at shellested@buildingexcellentschools.org or over the phone at 617-227-4545 x228.